Going to the beach in Norway can be a tropical summer experience. Nearly everything is within walking distance in Oslo, including the beaches. The Oslo fjord is right there, and the recent development of Oslo’s central harbour has created great options for water activities. Here are some great spots for a refreshing urban swim. In Norway, you might be away from dreamy Mediterranean summer, but still, there are many options nearby to enjoy swimming and what we call here as “summer” at no cost. The Guardian has picked this central swimming area as one of the top 10 seawater swimming pools in Europe. Opened in June 2015, Sørenga is a large fjord pool with seawater near the Opera house. It is part of a five-acre park, a free public space that offers a swimming pool, a beach, floating jetties, diving boards, outdoor showers, separate children’s pool, grassy areas and picnic areas on the wooden decks. The Sørenga pool is open to the public and free all year round. Tjuvholmen City Beach is located at the edge of the island of Tjuvholmen, at the end of the Astrup Fearnley Sculpture Park. The beach itself has pebbles, and is perfect for children. If you’d like to go on a swim, it’s possible to jump right out from the pier outside the beach. If you would like to swim a little bit outside of Oslo center, then these islands are for you. 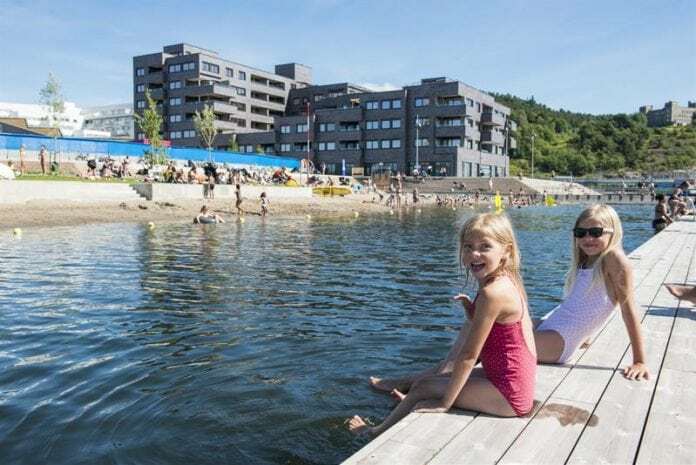 Three connected island in the Oslo Fjord with great places for swimming and sunbathing, especially on the east side of Gressholmen and the south side of Rambergøya. Heggholmen has one of the oldest lighthouses in the Oslo Fjord. The islands can be reached by ferry from City Hall Pier 4 in summer. Rambergøya and the northern parts of Gressholmen are nature reserves, and the bay between the two islands is an important nesting area for sea birds. From the late 19th century Heggholmen was a small industrial community, and Gressholmen was the location of Norway’s first main airport established in 1927.